I've hit that weird August mood where I'm finally settling into the summer brights, but the fall collections are starting to come out. It's one of those awkwardly in-between months, like November or February, when you've got one foot in the next season. My August swatches are going to wind up being a hodgepodge of what's left of summer and the most exciting of the new fall stuff. 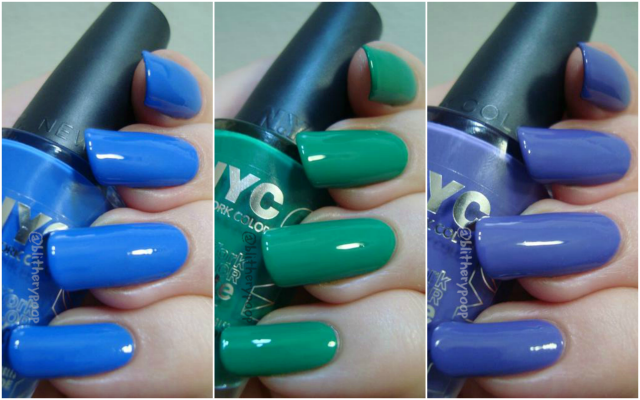 Today I've got three from NYC's City Samba collection. It's been available at Rite Aid and Kmart since June, but I didn't make my picks until a couple of weeks ago. When I saw G's swatches on Nouveau Cheap, I turned my nose up at the frost (WHY is that a trend again!?) and I think the rest of my head went with it. Still...there was a sale at Rite Aid AND coupons and my typical "safe" color choices happened. 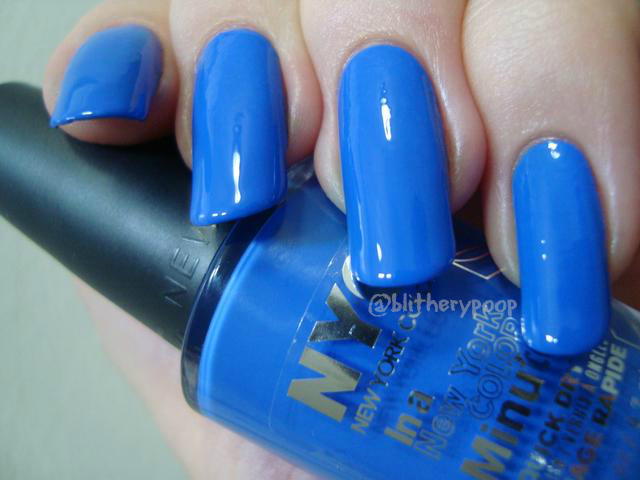 Ocean Blue is a blue cream, just a hint away from true blue. 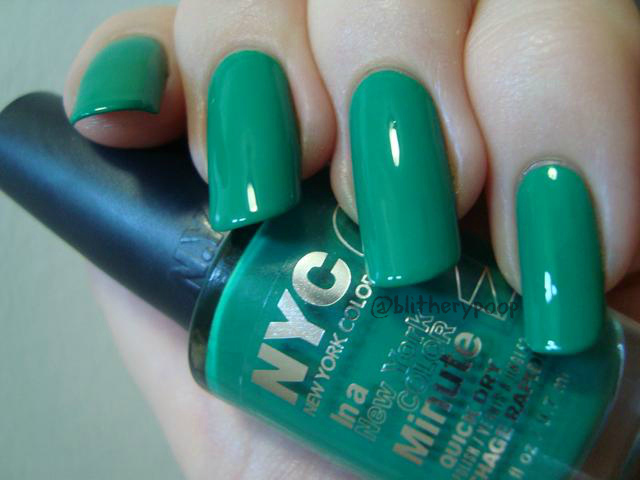 I love the color, of course. It is a blue cream, after all. The formula though? Not good. This is two coats and it dragged, glopped, bubbled, and just generally fought me the whole way. Bleh. It's pretty rare to find an NYC polish with a bad formula, but it happens to every brand from time to time. Hopefully thinner will help. I've seen Ocean Blue mentioned as a dupe for the old version of Sally Hansen Pacific Blue, but...not quite. Palm On The Beach is a vibrant blue-toned green cream. I knew this was gonna be a problem! I didn't realize when I bought it, but Palm On The Beach is reminiscent of Sinful Colors Garden Party. It's every bit as impossible to photograph. To get an idea of the color that it actually is, check out the promo pic on Nouveau Cheap. It's not exactly right either, since it's one of those vibrant colors that computer/phone screens can't really display, but it's closer than I could manage. The formula's better than Ocean Blue, but still not as good as I usually expect from NYC. It's another two-coater, but manages somehow to be thick and yet slightly floody. The frustrating part was the yellow leaching I got when I applied topcoat. I've only had that happen once or twice before, though it doesn't change the look of Palm On The Beach as much as it does to other shades with this issue. I wore it as a full mani for a night at a local community fair and worried about staining. It did. Nothing ghastly, but if your nails aren't a perma-yellow like mine it's something you might want to consider. I mentioned a similarity to Garden Party and I'd initially thought they might be dupes. A comparison feels almost a little silly here, since the colors don't show accurately, but it does give you an idea of the difference between the two. It's one of those times when you don't need both. Garden Party isn't as widely available, but it is a one-coater. Jacaranda Flower is a medium blue-toned purple cream. Pretty, isn't it? I couldn't come up with anything close enough to compare for this one. Unfortunately I had a variety of issues with this one too. It took three coats for opacity, since it's on the watery side. The real problems are its draggy application and...again...bubbling. Bottom line: I'm not thrilled with the formulas, which is a bit surprising for this brand. If you missed out on the old version of Sally Hansen Pacific Blue, Ocean Blue is close, but not a true dupe (and I had issues with the formula). Palm On The Beach is similar to Sinful Colors Garden Party, but also not a dupe. It's a lot brighter in person and is my favorite of these three. Jacaranda Flower is a great color, but watery. What season's colors are you feeling right now? I know some people are clinging to summer while others are yearning for fall. While sometimes I like to lay back and admire some summer colors, I'm desperate for Fall season to hit full force. It's my thing, fall colors embrace me & please be here already! I wanted these so bad! Sadly, it looks like Kansas doesn't get any of the good stuff.